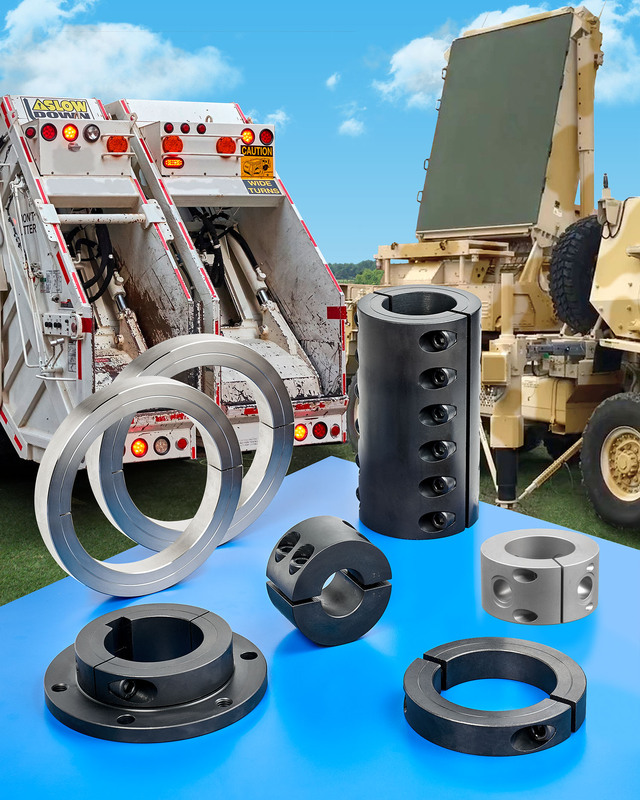 A line of large bore shaft collars, couplings, and mounts that are ideal for heavy-duty special purpose commercial and military vehicles and equipment has been introduced by Stafford Manufacturing Corp. of Wilmington, MA. Stafford Large Bore Shaft Components include 1-pc and 2-pc shaft collars in sizes up to 14” I.D. and varying O.D.’s, rigid couplings with bores to 6” and lengths to 16” and flange mounts with bores to 6” and flanges to 14” O.D. Available machined from steel, stainless steel, special alloys and aluminum, they offer design flexibility for builders of heavy-duty special purpose vehicles and equipment subjected to constant use and potential abuse. Featuring robust construction, Stafford Large Bore Shaft Components have larger bores and are wider than conventional parts, incorporate larger clamp screws, and can be modified with threaded bores and special bore contours, keyways and tapped holes as required. Applications include trash haulers, fire-fighting equipment, all-terrain vehicles, utility trucks, and all types of commercial and military vehicles and equipment. Stafford Large Bore Shaft Components include standard and custom parts that are priced according to configuration and quantity.